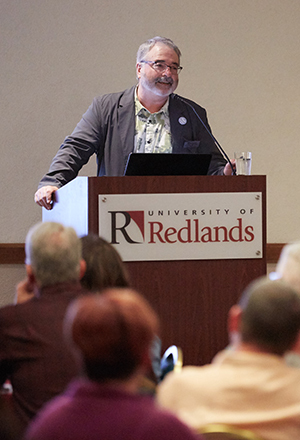 On March 26, the University of Redlands community celebrated spatial learning, research, and community service at the annual Spatial University Symposium. This year’s symposium focused on the theme of improving access to STEM education and careers for students of all ages by leveling the playing field with spatial training. The event opened with posters and story maps presented by members of the University community—focusing on topics from religion and history to education and city planning. Jessica Mosher ’19, a student in the MBA Location Analytics program, studied the effects of the recent Netflix series Tidying Up with Marie Kondo on thrift store donations in high-income areas. “I view the world around me in very different ways now because I have learned about spatial thinking. Before this program, I would have written a research paper about the ‘Kondo effect’ to meet a class requirement. Now I can find data to make the best-informed decision about a theory,” she said. During his talk, Moore shared findings from a recent study he conducted at a charter school in Yucaipa, California. Moore’s research, which was funded by the National Science Foundation, documented the positive impact that spatial training activities—such as playing with Legos®—has on children’s spatial thinking abilities, computational thinking skills, and mathematical performance. 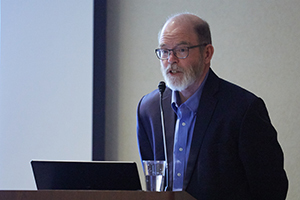 Bob Kolvoord, professor and dean of the College of Integrated Science and Engineering at James Madison University, delivered the evening’s keynote address, picking up on some of the points in Moore’s talk. For the last 25 years, Kolvoord has explored ways to integrate visualization and GIS tools in K-12 classrooms and curricula and studied their impact on students. Kolvoord also co-created the Geospatial Semester, which encourages high school students to earn college credit by taking a course focused on GIS and the development of spatial thinking. Showcasing data collected from the Geospatial Semester, Kolvoord noted that spatial ability and interest in STEM careers is often based on gender and socioeconomic status. Parents of girls often don’t encourage their daughters to engage in activities that involve mathematics and spatial thinking. The results are similar for students with lower socioeconomic status. Kolvoord concluded his talk by displaying composites of brain activity from students who participated in the Geospatial Semester. From the beginning of the program to the end, students’ brain activity revealed that accomplishing spatial tasks became easier the more they engaged with GIS software and activities. 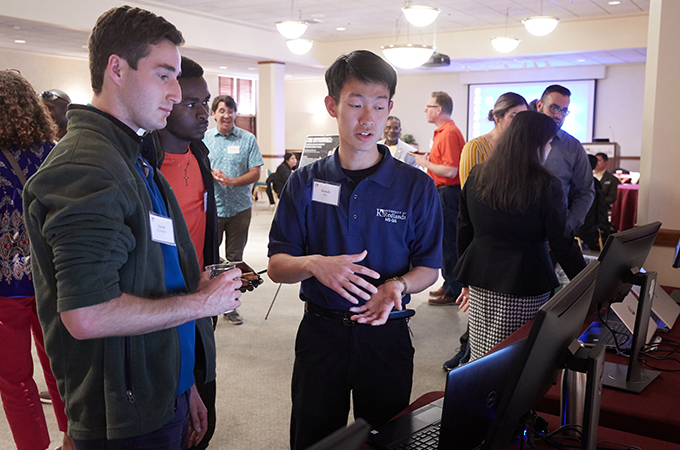 Jason Wolff ’19 received the undergraduate Center for Spatial Business Student Excellence Award for a project that examined the spatial qualities of the distribution network for Aeon, a small company that repairs and sells disc drives. Mickey Betancourt ’19, Robert Ping ’19, and Daniela Belsaguy ’19 received the graduate Spatial Business Award for their research of the East Valley Water District and the aging of the company’s water pipes. Veronica Creed ’19, an environmental studies student with minors in spatial studies and mathematics, won the Tomlinson Prize for Excellence in GIS for activities including cofounding the community mapping club, collaborating with faculty members, and interning at the Center for Spatial Studies. Jonah Lay ’19 was awarded the graduate Tomlinson Prize for his leadership, collaboration, and success within the MS GIS program, and spatial research conducted with Chemistry Professor Rebecca Lyons on the release of endocrine disrupters from glaciers melting as a result of climate change. Learn more about the Center for Spatial Studies, the Center for Spatial Business, the MS GIS program, the MBA with a concentration in location analytics, and the Spatial Studies minor at the University of Redlands.